If you've ever wondered what your website looked like as a graphic, maybe you should try this! Just enter your URL, hit 'Enter' and wala, you'll see the little flowers developing. Instant art. Fun! - Link via Design Sojourn. ...enjoying all my purchases from Target (they have finally arrived!) and Japan (accessories galore! ), getting wardrobe ideas from Japanese magazines like nonno and More, exploring the Arab Street area, green tea, straight leg jeans, Fancl Washing Powder, creating my own jewellery, watching Korean dramas on Youtube, enjoying nerdy humour from xkcd. It took me a while, but I have at last uploaded all my photos of Japan to foist on friends and loved ones. Part of the reason why I picked Tokyo for this year's holiday was all because of Japan Hour. If I happened to be home on a Sunday afternoon, I would always tune into Channel News Asia to catch lucky locals travel around Japan, stay at beautiful ryokans and having incredible oishi-looking kaiseki meals. After so many hours of salivating over the meals, I decided that enough was enough and that I had to go to Japan to get my own Japan Hour experience. First lunch in Tokyo! I wandered around Shinjuku until it was lunchtime, and then randomly went into a sushi joint in one of the little side-streets. This place didn't have an English menu so I just ordered the cheapest set menu they had. 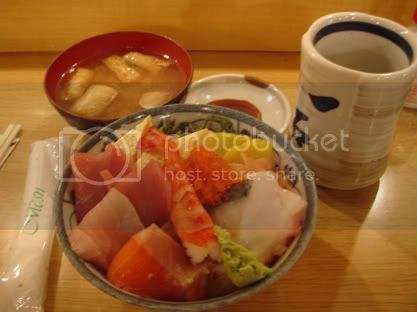 It turned out to be a delicious bowl of rice topped of with sashimi, and a bowl of miso soup. One of the things I love about the big department stores in Tokyo are the food basement halls. Think our own Takashimaya food hall, only bigger and better. The halls are chock full of fresh produce, aisles of Japanese sweeties (they sure love their pastries! 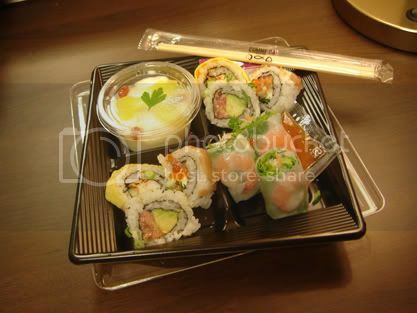 ), and lots of little takeaway dishes. I decided to eat cheap on my second night in Tokyo, and bought this set from the Comme Sa deli in the basement of Isetan in Shinjuku. 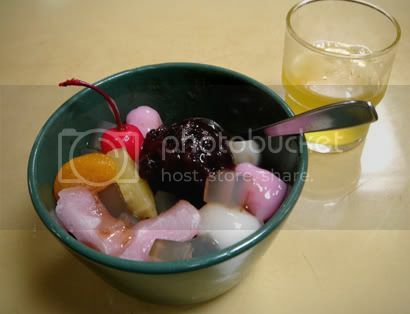 This set came with Vietnamese rice paper rolls, two kinds of sushi and an almond jelly dessert. This is in Gion, Kyoto. I had just had a very filling breakfast provided by the ryokan, so I decided to forego lunch. But, it was a very, very hot day, and I was parched from wandering around the temple and gardens in Gion, and was in need of a drink. Then, I spotted this little sweet shop with the little plastic imitations of its desserts in its front window. Everything looked so tantalising that I decided that I just had to try something from in there. 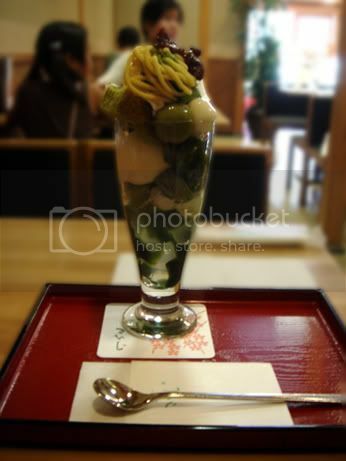 It was a tough choice, but I ended up picking this green tea parfait. Par-fection. Another day where I'd had a very filling breakfast and decided to skip lunch. This time, I had a huge sushi meal from the Tsukiji fish market, and just knew that the rice would be sitting in my stomach for a long time. But again when wandering around Asakusa, I saw another dessert place and just knew I had to have another one of the yummy desserts. This is an anmitsu something. My last meal in Tokyo! Instead of eating Japanese, I decided to give their bakeries a try. 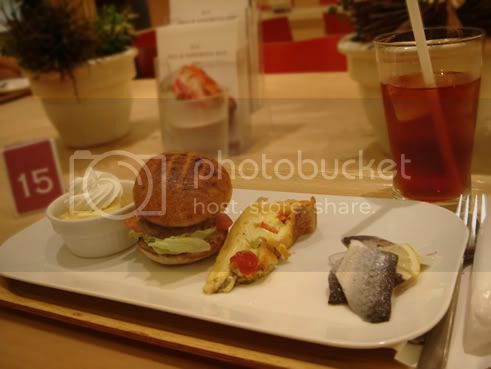 This was a Danish (I think) bakery in Omotesando, which had a little cafe/deli in their basement. I was attracted by the cute little hamburger (hum-baa-gaa) set on display, and decided to give that a go. Everything was good, but I wasn't too keen on the dessert - some sort of custard.